City palace is situated in the heart of the Pink city, slightly northeast ?f the very centre ?f Jaipur. Although the Palace was designed according to the Vaastushastra but still Rajput, Mughal and European architectural styles are reflected in the City Palace. The City Palace was built under the rule of Maharaja Sawai Jai Singh II in the year 1699 and continued till 1744. The city palace is divided into two parts- One part is Sawai Man Singh museum and other is still the residing palace of the former Maharaja. Some of the attractive things in the City Palace are Udai Pol, Jaleb Chowk, Tripolia Gate and Virendra Pol, or we can consider them as the various entrances to enter into the Palace. They all are decorated in a fabulous way. The Tripolia gate is reserved for entry into the palace by the royal family. Common people and visitors can enter the place complex only through the Virendra Pol and the Udai Pol or the Atish Pol also known as Stable Gate. 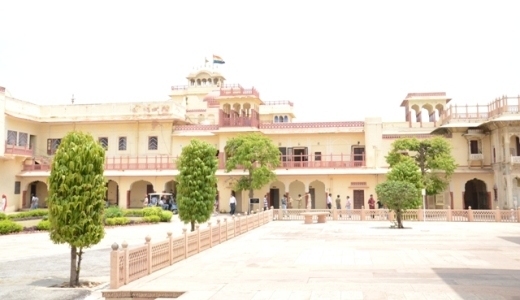 The entry from Virendra Pol leads to the Mubarak Mahal. The Palace is designed in a grid style and also has various Mahals and temples in it like: Chandra Mahal, Mubarak Mahal, Diwan-E-Khas, Govind Temple and many more which one must see while visiting City Palace. Mughal Style is shown on the gates and walls of the Palace which contains lattice and mirrors in them which adds more beauty to the palace. City Palace is very popular and famous tourist spot in Pink City. The palace shows the regal architecture and rich heritage of Mughals as well as it also shows the interesting view of the Pink city. The former maharaja still lives in the top most floor of Chandra Mahal which is also known as Moon Mahal which was built by Sawai Jai Singh II. Beautifully carved, two marble elephants greet at the doorstep of the City Palace, where the ‘Mubarak Mahal’ emerges first or welcome palace which is also known as reception center which was constructed by Maharaja Sawai Madho Singh II, who was the grandfather of the Present Maharaja. Mubarak Mahal contains the textiles and arms museum in it, where the ornaments and the dresses of the earlier Rajas are kept which gives the tourists the tremendous look. There is a Clock Tower near Mubarak Mahal. Sileh Khana has a collection of armory and weapons. The next courtyard shows the Diwan- E-Khas which is also known as Hall of Private Audience which is fully built with marble and sandstones. It has two huge silver vessels on display .In the western side of it is the Pritam Chowk also called as Peacock Courtyard, which is having four beautifully designed gates. Diwan- I- Am is the hall of Public Audience which contains the miniature paintings, carpets, photographs in it. To construct this fabulous palace Rajasthani and Mughal architectural techniques are used in them. Govind Dev Ji temple is renowned for its structure which is rooted at a height of 119 feet with an area of 15, 827 sq. feet. 5000 people can go inside the temple at a time. This temple displays an amazing architecture. Charges for going in City Palace is Rs. 35.00 for Indians and for foreigners Rs.150.00 inclusive of entry to Jaigarh fort and the timings are from 9:30 am to 4:45 pm. The City Palace does not only have a lot of historical significance but it also reminds us about the royal past. It stands as a symbol of the royal elegance and courtly splendor that is no longer visible. The nearby Tourist attractions included Hawa Mahal, Jal Mahal, Government Central Museum , Jantar Mantar and Vidhyadhar’s Garden.